Phytophthora boehmeriae Sawada is a species that has been recorded on only a few hosts (Erwin and Ribeiro 1996) since its first description in leaves of Boehmeria nivea (L.) Gaud-Beau, in Taiwan (1927). It has also been reported in China, Australia, Greece (Erwin and Ribeiro 1996) and South Africa (Roux and Wingfield 1997). In South America, it was reported only in Argentina on citrus (Frezzi 1950), and in Brazil on black wattle (Santos et al. 2006). Erwin and Ribeiro (1996) report some additional trees as hosts: Deodar cedar (Cedrus deodora (G. Don) D. Don), eucalyptus (Eucalyptus pilularis Sm.) and Mexican yellow pine (Pinus patula Schiede ex Schlectendahl et Chamisso). In black wattle (Acacia mearnsii De Wild. ), P. boehmeriae has been reported in South Africa (Roux and Wingfield 1997) and Brazil (Santos et al. 2006), thus becoming one of the causal agents of the disease known as gummosis, along with P. nicotianae (Santos et al. 2005), P. frigida (Alves et al. 2016) and P. meadii McRae (Roux and Wingfield 1997). Gummosis is the main disease of black wattle in Brazil (Santos et al., 2005) and South Africa (Roux and Wingfield 1997). It is characterized by necrotic lesions on the trunk, from the collar to the upper portions, with or without gum exudation (Santos and Luz 2007). 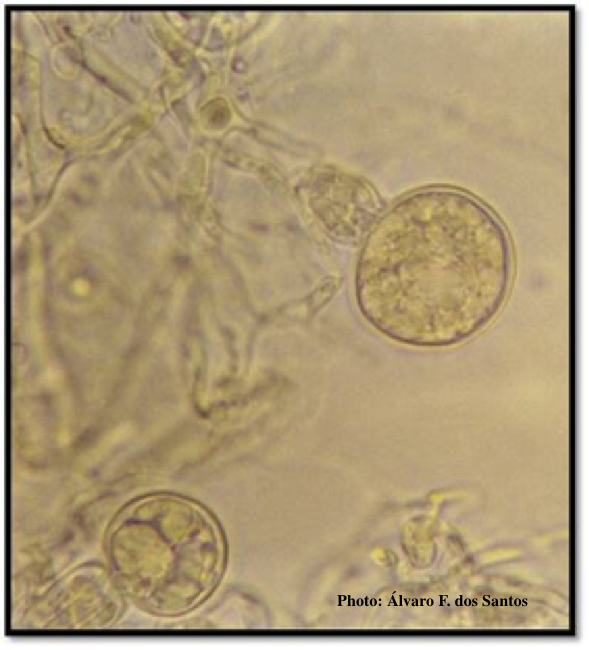 Sporangia showing ovoid and ovoid to spherical shape and papillate condition (reproduced with permission Summa Phytopathologica, courtesy A. F. dos Santos). Sporangia of P. boehmeriae are ovoid to spherical, papillate and caducous, measuring 35 μm × 30 μm, with a length:width ratio of 1.16:1, mean depth of papillae of 4.83 μm, and exit pore of 4.69 μm. 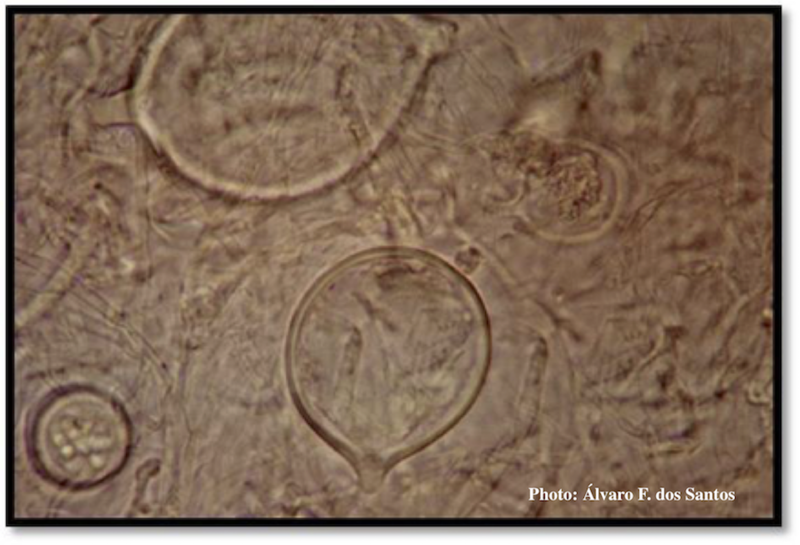 P. boehmeriae is homothallic, forming plerotic oospores with smooth walls and amphigynous antheridia. Cultures produce oospores abundantly. Chlamydospores are terminal or intercalary (Santos et al. 2006). 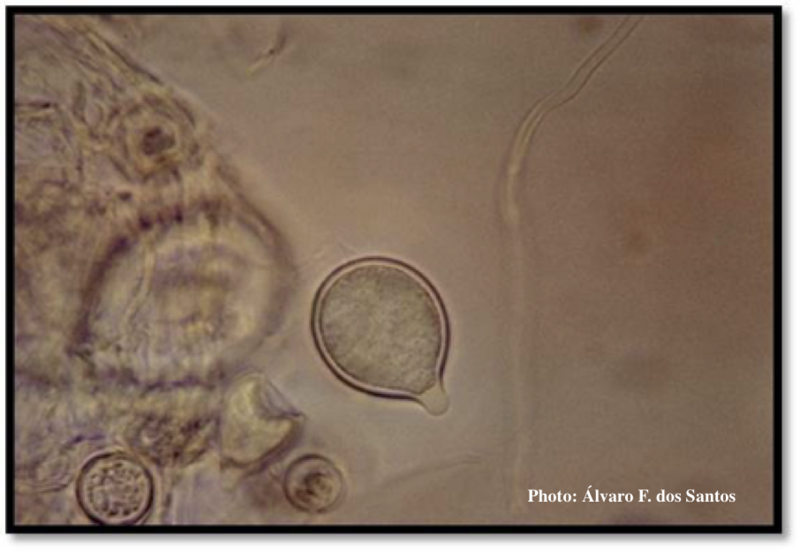 Left: Oogonia and oospores with amphigynous antheridia. Right: Globose chlamydospore. (reproduced with permission Summa Phytopathologica, courtesy A. F. dos Santos). 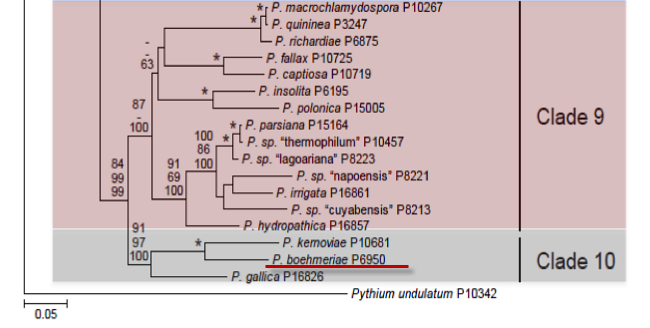 Phytophthora boehmeriae is placed in Clade 10 (Kroon et al., 2012). 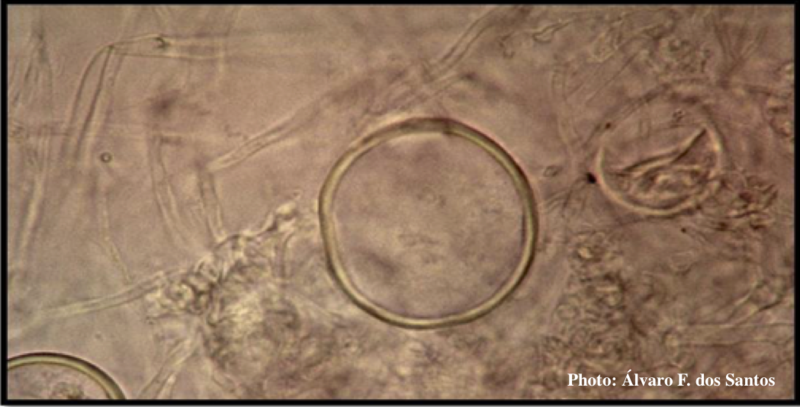 In carrot-agar culture, P. boehmeriae has a petaloid appearance with maximum mycelial growth at 24oC, and no growth at 32°C (Santos et al. 2006). Phytophthora boehmeriae is distinguished from the other species that cause gummosis (P. nicotianae and P. frigida) especially by being homothallic and producing caducous sporangia with short pedicels (<5 μm), and showing no growth at 32°C (Santos et al. 2006). The species P. meadii does not occur in Brazil, and differs from P. boehmeriae in the production of caducous sporangia on medium-length pedicels (18 μm) and being heterothallic (Gallegly and Hong 2008). For more information about Phytophthora boehmeriae, visit our Disease, Education and Management materials, and Reference sections.